Investors are buying platinum coins and other platinum bullion to directly own tangible private platinum investment vehicles with exposure to the fluctuating platinum spot price. Platinum is a rare precious metal and its price per ounce has been higher than gold for many years at a time. Platinum had a major price drop at the onset of the 2008 financial crisis. Since then platinum coins have become an attractive “value buy” amongst platinum bullion buyers and investors. With the 2008 drop in platinum price there was a near simultaneous launching of platinum exchange-traded funds (often referred in short as platinum ETFs) and platinum exchange-traded notes (called a platinum ETN in short). The sharp drop in record high platinum prices and the introduction of new methods to gain platinum price exposure, investor demand for platinum related funds saw a double digit increase in US dollar volumes within the first decade of the 21st Century. 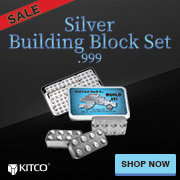 Kitco offers both private mint guaranteed platinum bars and government mint guaranteed platinum coins for sale. All platinum bullion products we carry are made of a minimum .999 platinum bullion fineness. Physical platinum bullion coins and bars will remain a trustworthy platinum investment for the long term. Platinum is so rare in supply that all the platinum ever mined in human history could fit inside the average United States citizen’s garage. Officially discovered in the 18th Century, modern mining experts estimate that throughout history over 15 times more gold and about 150 times more silver has been mined than platinum. Mining experts also estimate that just over 10,000 tons of platinum have ever been mined by mankind. As recently as 2016, bullion industry reports show just over 2,000 metric tons of platinum remaining above ground. Capital flows for platinum investments have increased substantially since the start of the 21st Century. Today close to 90% of the fresh world’s platinum supply is dug up from just four major mine sites. Three of these major platinum mines are located in South Africa, while the remaining other major platinum mine resides within Russia. Since the beginning of the 21st Century, annual worldwide demand for platinum has averaged just over 7 million ounces per year. The next largest sector of platinum demand is for platinum jewelry, due to the precious metal’s resistance to tarnish and warping. The smallest of the four segments of the world’s platinum demand comes from the platinum investment sector (ranging from electronic shares in Platinum ETFs to actual physical platinum coins / platinum bars from platinum dealers and where to buy platinum online like us here at Kitco). Door to door Platinum coin delivery? Safe shipment in the mail of platinum bullion coins and bars is more common than you might think. Upon fully cleared payment of your order with Kitco, your platinum coins or platinum bullion bars are secured tightly in nondescript packaging. All precious metal parcels are shipped with full insurance, postal tracking, and adult signature requirements. You can elect to deliver and store your platinum coins and platinum bars safely and securely with Kitco’s Allocated Storage Program. Kitco offers multiple third party, non-bank platinum vault options all fully insured, segregated, and allocated as your property at all times. Keep your physical platinum bullion purchases safe outside of the banking and financial systems with our Platinum Storage Solutions. Why are investors buying Platinum Coins? Since around the year 2000, there has been a general increase in platinum prices in virtually all currencies. As well there has also been an increase in the numbers of platinum coins being sold to the investing public. Since the 2008 Financial Crisis, the trend of online platinum dealers selling platinum coins and bullion bars to the investing public has increased as well. It is quite common for investors to buy platinum coins online with the intention to take physical delivery in order to better diversify risks to their wealth and investment portfolios. Why buy Platinum Coins from Kitco? Finding a trusted local or online platinum bullion dealer who promptly delivers quality platinum coins and platinum bullion bars at fair and reasonable prices can be difficult. Our organization has been working in the platinum bullion and precious metals industry for over 40 years. In our time we have seen many local and online platinum bullion dealers come and go. 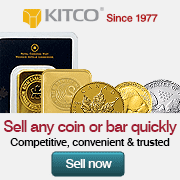 Since 1977, Kitco has been selling and buying platinum and other precious metal bullion. We are the world’s #1 Platinum News website and a trusted online platinum coin dealer. Want more information on how to buy and sell gold? How to buy and sell silver? 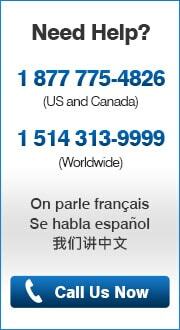 Please reach out to our first class Customer Service Representatives by email or by phone, at info@kitco.com, or using 1 877 775-4826 (US and Canada), 1 514 313-9999 (Worldwide).